Mint condition south facing two bedroom with two full baths, full-time doorman and enormous private landscaped garden and five person Jacuzzi. Escape to this beautifully-proportioned retreat with one-of-a-kind solarium and spectacular Hamptons-esque private outdoor garden ? an oasis of outdoor tranquility and solitude. The 700sf fully-enclosed private outdoor space features a jacuzzi, shed, and an array of lush botanical treasures. The airy and expansive living room includes 11 foot ceilings, crown moldings, hardwood floors, floor-to-ceiling windows and picture frame doors. The open chef's kitchen has a breakfast bar, granite countertops and top-of-the-line stainless steel appliances. The spacious master bedroom has a full bath ensuite, high ceilings and large windows facing the totally private confines of the garden outside. 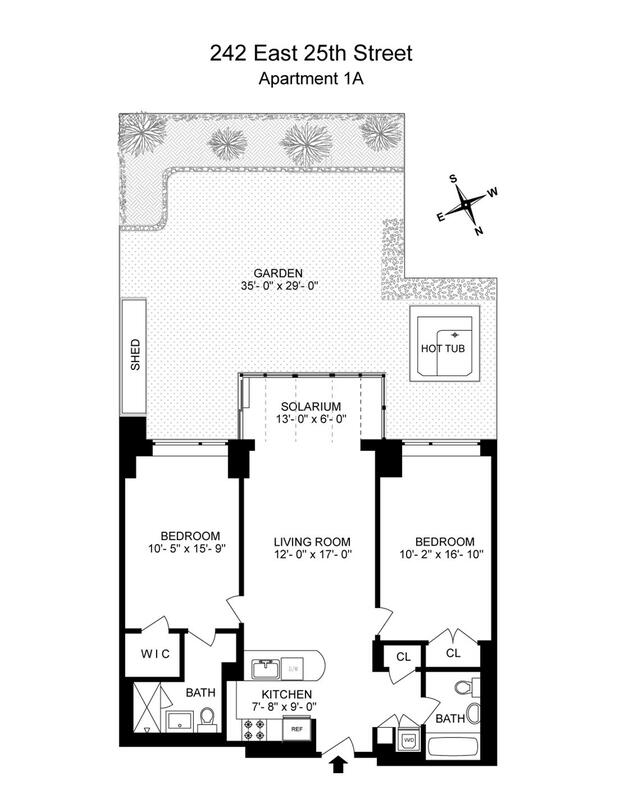 Both bedrooms have cleverly-conceived built-ins and warm Southern sunlight. Operating as a condominium, 242 E 25th Street features a twenty-four hour doorman, fitness center, roof deck, live-in super and storage. Eighty percent financing, LLC ownership, co-purchasing, guarantors, parental purchasing, pied-a-terre ownership, immediate subletting, and pets are all permitted.